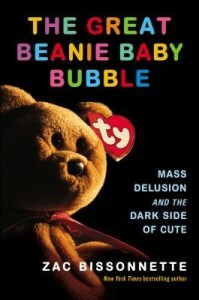 “The Beanie craze was a lifeline…to mom-and-pop retailers who were struggling the late 1990s”, according to Zac Bissonnette in his recent book entitled The Great Beanie Baby Bubble: Mass Delusion and the Dark Side of Cute (Portfolio/Penguin, 2015). Our shop was among the thousands who benefited from Ty Warner’s decision to only sell Beanie Babies through independent retailers and a few high end toy chains. I had always wondered why he supported smaller stores, and thanks to Bissonnette’s fascinating and well-researched book I now know the answer. It wasn’t a love of independent retail that drove Warner’s decision — it was the fact that keeping his market small prevented the market from flooding. He also knew from his days as a high-grossing Dakin rep that the buyers for smaller shops could be more easily influenced (once might even say controlled), and that the personnel in these stores could be counted on to be knowledgable and enthusiastic about the details of introductions and retirements. Keeping the number of Beanies in stores low, and limiting their availability to only smaller stores, fueled the demand that saw some Beanies (now often worth less than their original $2.50 wholesale price) to sell for thousands of dollars on the secondary market. And although our shop never sold a Beanie for more than standard markup, we were able to spin straw into gold with the Princess Bears — the dozen we purchased for $33 earned about $4,000 for charity. I think that Warner’s decision to limit distribution of his product in order to maintain its value could resonate with other vendors in the gift market today. Making a product available on Amazon and through big box and discount retailers floods the market, which can lower the perceived value of a product. And the sales personnel in an independent retailer can be counted on to learn the story behind a line, and to take care to convey that information to the consumer. Because whether he used this information for good or bad, Ty Warner had come to the important realization that in many cases, independent retailers are the key to direct interaction with the shoppers. Hopefully other companies will consider this important edge when deciding on placement for their products — and will experience slow and steady growth rather than the crazy speculative ride that was the Beanie craze.